Vector Packs are a collection of commonly themed vector design elements. These designs are often used in graphic and web design projects. They are easily edited and a lot can be done with them, such as resizing, coloring and much more. Vector art is commonly opened and edited in the software Adobe Illustrator, but will also work with Adobe Photoshop and similar programs that are compatible with the .eps file format. How Come I Can’t Open the ZIP Folder? You may not have the proper software to open the ZIP Folder, which contains the files. The ZIP folder compresses the vector pack files so they are small enough to send via email. If you are on Windows try installing extraction software such as 7-Zip or Winzip so you can extra the files from the ZIP folder. What Type of Files do I Get? Each download comes with a .eps file which is a commonly used and supported graphic file format for vector art that will be compatible with most versions of Adobe Photoshop and Adobe Illustrator. Payments can be made securely online via PayPal, which allows you to pay using your PayPal account, checking account, debit or credit card. After purchasing a vector pack from us you will be emailed a download link almost immediately, although sometimes high server traffic can cause slight delays. 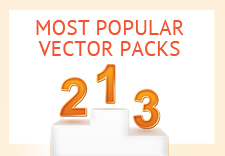 The download link will allow you to download a zip folder which contains the the vector pack file.